If you're confused about marketing versus advertising, you're not alone. While both platforms reach a targeted audience to promote products or services, they are very different. If you know the difference between the two and do your market research, you will be able to put your business on the path to success. 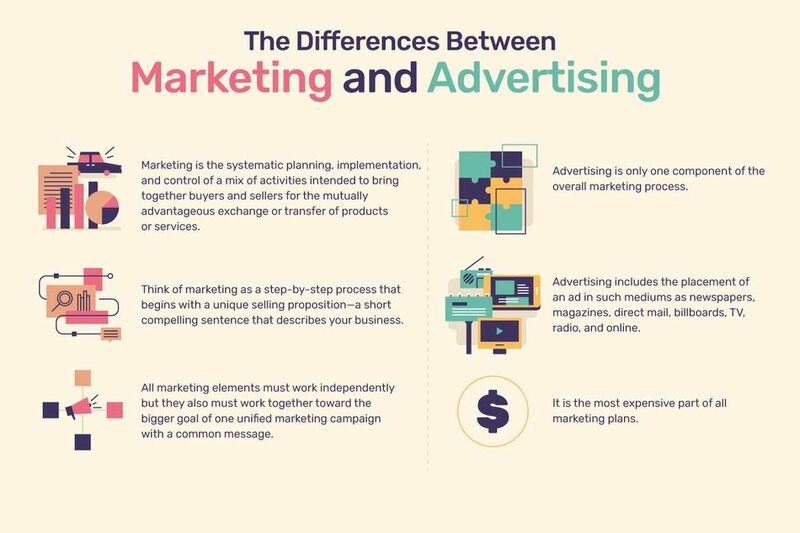 Let's start by looking at the basic definitions of each and then take a dive deeper into how marketing and advertising differ from one another because the difference is significant. Any ad (no matter what format it takes) is a paid, public (meaning non-personal) announcement that is a persuasive message made by an identifiable sponsor of a company, organization, or person to existing (or potential) customers or a non-profit member base. Advertising is only one component of the overall marketing process. Advertising is that part of marketing that involves directly getting the word out about your business, product, or service to those you want to reach most. Nearly all ads will have have the name of the sponsor (and very often a recognizable logo). Advertising includes the placement of an ad in such mediums as newspapers, magazines, direct mail, billboards, TV, radio, and online. Increasingly, as the world of print advertising shrinks, people are finding more creative ways to advertise, such as displaying signs on top of taxis. Advertising, because it involves so many layers—including art and design, ad placement, and frequency—is the most expensive part of all marketing plans. Public relations (because it is very labor intensive) is the second most expensive marketing component, and market research is the third most expensive. Marketing is the systematic planning, implementation, and control of a mix of activities intended to bring together buyers and sellers for the mutually advantageous exchange or transfer of products or services. For our purposes, let's use the terms buyers and sellers loosely. Even if you run a non-profit environmental organization you still have to sell people on the idea that wind is a good power source for clean energy. Think of marketing as a step-by-step process that begins with a unique selling proposition—a short, compelling sentence that describes your business. This proposition (or message) then acts as a guiding theme that helps you identify target clients who are interested in what you're selling. If you think of marketing as a pie, the whole marketing pie can be divided into advertising, market research, media planning, public relations, community relations, customer support, and sales strategy. Advertising, while the most in-your-face slice of the pie, is still only one slice of the marketing pie. All marketing elements must work independently but they also must work together toward the bigger goal of one unified marketing campaign with a common message. Marketing is a process that takes time and can involve hours of research in order for a marketing plan to be effective. Think of marketing as everything that an organization does to facilitate an exchange (or a conversation) between the company and the consumer. Of course, before you buy ad space in any format (or hire a PR pitch person) you must conduct your market research to determine who your target audience is—and the best way to reach them. It may end up that a social media platform like Instagram is the best way to reach your client base. Or, it may end up your client is better served by penning a series of traditional print media op-ed columns. However, once your research is complete you can start developing your marketing strategies, and then all the other dominos fall into place. What Is the Cost per Rating Point (CPP) Calculation? How Does a Marketing Firm Grow Your Business? What Is Crowdsourcing and What Are the Popular Types?